Northern Germany, from the Polish borderlands in the east to the Netherlands in the west, is the stronghold of Germany’s muscular onshore wind power industry. This is where the lion’s share of the country’s nearly 30,000 wind turbines are sited, a combined force equal to the power generation of about 10 nuclear reactors. Where Germany’s northernmost tip abuts Denmark, soaring turbines crowd the horizon as far as the eye can see. And many more are coming as Germany strives to go carbon neutral by 2050. Yet despite their impressive might, the north’s wind parks are a reminder not only of how much has been accomplished in Germany’s Energiewende, or clean energy transition, but also of what remains to be done. 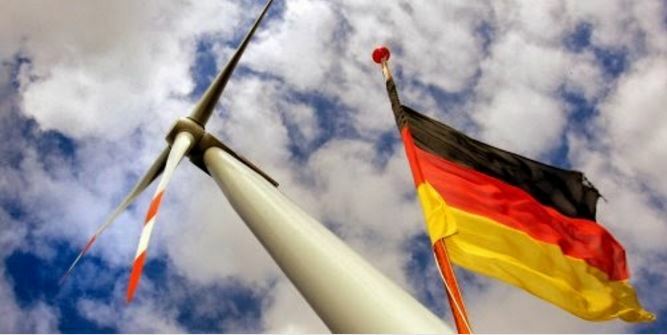 Although the country has made a Herculean effort to shift to a clean energy economy — in just the past five years government support and costs to consumers have totaled an estimated 160 billion euros ($181 billion) — Germany’s greenhouse gas emissions have not declined as rapidly as expected in response to the vigorous expansion of renewable energy, which now generates 40 percent of the country’s electricity. Germany’s politicians are even resigned to falling significantly short of the country’s 2020 goal of reducing emissions by 40 percent below 1990 levels. Germany’s failings have come as a vexing shock to its environmentally conscious citizenry. While Germans still overwhelmingly back the energy transition — for years polls showed support in excess of 90 percent — about three-quarters say the government is not doing enough to slow global warming. Today, the Energiewende finds itself stalled and floundering. Germany’s carbon emissions have stagnated at roughly their 2009 level. The country remains Europe’s largest producer and burner of coal, which generates more than one-third of Germany’s power supply. Moreover, emissions in the transportation sector have shot up by 20 percent since 1995 and are rising with no end in sight, experts say. German consumers have seen their electricity bills soar since 2000, in part because of the renewable energy surcharge. Fur as I know, piston engines are positive displacement machines, so driving a certain distance will produce a specific amount of noxious exhaust gases, no matter how fast the engine turns with time to get there. I don’t believe total emission changes with autobahn speeds. Emissions testing in the US always operates at idle and stable engine temperature, being the worst-case. Above about 1500 rpm it flattens out, following the power curve. Or so I have observed, but maybe someone else knows more detail? JB : What of increasing fuel consumption to overcome increasing air resistance as velocities increase ? I suspect that the graph of true overall energy costs plotted against the ratio of intermittent to reliable generation will be exponential in nature. All you have to do is look at a graph of China and India’s current and projected CO2 emissions vs the rest of the world until 2030 to know that whatever emissions reduction can be achieved by small developed countries like Germany (and even the USA) are pointless. So the whole Paris Agreement is a giant confidence trick on the developed economies. Why is any developed country stupid enough to play this rigged game? China used more cement between 2011 and 2013 than the US did in the entire 20th Century. Emergency diesel generators have been installed in South Australia, Tasmania and now Victoria. Also I am told that much of the UK’s STOR scheme relies on diesel generators. One of the biggest gas users in South Australia is building a new plant based on gas fired reciprocating engines (diesels) to replace their older, less flexible gas fired units. Much as hydro was reclassified as “renewable” how long before the essential diesel generation is classified as “renewable”? Fuel consumption goes up with the cube of velocity. However, since it takes less time to travel a given distance the consumption actually increases as the square of the velocity. DB – meaning ‘Fuel consumption per hour goes up’…etc. [or other unit of time]. Oldbrew I suggest that the Chatham House figure for cement CO2 emission in production is absolute nonsense. I see on the internet an emission of 4- to 5% of world fossil fuel emmision from various sources and even those are exaggerated. because of wrong assumptions of what is cement and how it is made and used. For example in Australia cement as sold has a number of what is called extenders. Firstly, nearly all cement has 4-6% of gypsum added as a set controller. Then most cement now add something like 5% of very fine limestone as a filler which improves strength. Around 30% of the cement sold contains finely ground blast furnace slag (some cements have no slag while others such as sulphate resitant and low heat cements have 50-60% ground slag). There are cements which use fly ash upto 30% sold for home use such as builders cement. Nearly all concrete suppliers add fly ash separately at concrete batch plants to extend the cement. None of these additives which in total add to over 40% of the total equivalent cement have direct CO2 emission. Australia is not alone in using these cement extenders or replacements. It is part of European Standards. You will find similar situation in most European countries where slag and flyash are available. I have long noted that cement production and consumption is a leading indicator of economic growth. Japan in the late 1980’s reached about 900kg/capita as it powered to be one of the leading countries. They were followed by South Korea in the late 1990’s (South Korea is now more technically advanced than most European countries. Thailand and Veitnam have reached close to 1 tonne/capita in the last 15 years. China has exceeded 1 tonne/capita 4 years ago before their building boom declined. India and Indonesia have lagged with production under 500 kg/capita but the industry is growing fast in both countries. Both these countries are installing modern large capacity and are just starting to use slag and flyash.. The Greens always lie and want to make someone responsible to support their lies. Like blaming cows for emitting CH4 which the greens have lied about being an important greenhouse gas. They will achieve nothing by pretending that the cement industry in the developing world (India, Indonesia, Brazil, other South American countries and African countries) should be curtailed. Germany started down the slippery slope to energy lack the moment they got beyond 15% renewables. They have got to the stage where surrounding countries are refusing to accept their intermittent excesses for fear of damage to their own grid structure and industry are having to install their own power plants for continuity of production. The Germans have a decision to make – dump the obsession with all things to do with the church of climatology or become a third world nation. Unfortunately, as a people they are very susceptible to the ‘big lie’, it took them into two world wars, and they have accepted the ‘big lie’ of the UN church of climatology. There might be hope for them further down the road as Jacques Abbadie said in 1684 ‘One can fool some men, or fool all men in some places and times, but one cannot fool all men in all places and ages’, or as is more common ‘you can fool all the people some of the time and some of the people all of the time but you cannot fool all of the people all of the time’. The question arises, what will the people do when they realise they have been fooled? We are at a crossroads, and are being tempted hard to go down the path of the climate change obsession. That path leads to tyranny by the climate obsessed, who seek to criminalize daily living. The other path leads to global prosperity and opportunity. For the greenhouse effect to work as advertised the surface of the earth must radiate as an ideal black body. However, the non-radiative heat transfer processes of the contiguous atmospheric air and water molecules renders such ideal BB upwelling impossible. Because the atmosphere and the albedo it creates reflect away 30% of the incoming solar energy the earth is cooler compared to no atmosphere and does not warm it per greenhouse theory. Without the atmosphere the earth would be much like the moon, blazing hot on the lit side, bitter cold on the dark, a bone dry, gray, barren rock, nothing like a frozen ball of snow and ice.